Is my two front teeth to get straightened, on someone else’s credit card. Actually no. I’d settle for a few nice fellas who are cute in their headwear. I know you’re shy, boys, but don’t be. There’s nothing wrong with having a nice helmet on. I won’t make you do nothing crazy for the camera’s, just stand there and smile a bit for the ladies at home. Otherwise, I’m suffering a serious gender imbalance. Honestly, for every girl I spy riding home looking “super sweet” I see another five fellows looking like their helmet has been rotting away in the back of the garage with rats and ‘roaches eating it before they decided to put it on their head. Gross. Do like this fellow does. 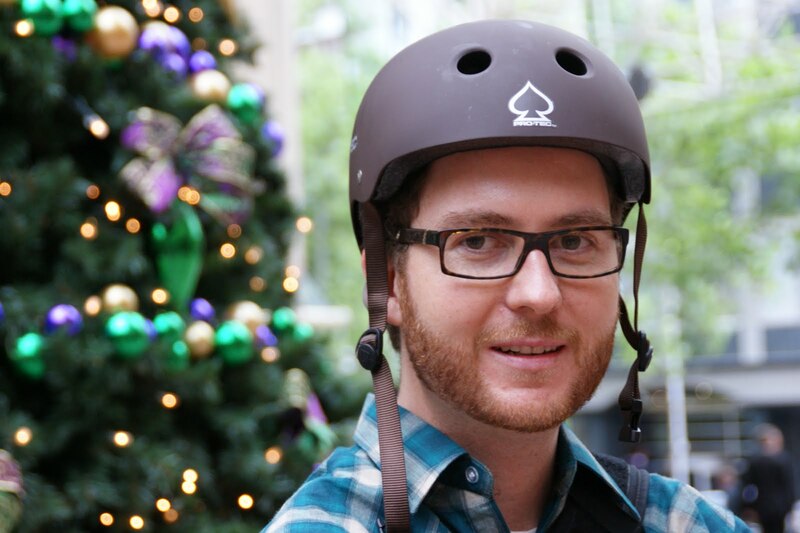 Get a nice plain helmet that matches your glasses and don’t be afraid of clean clothes.